When is the best time to go to Six Flags Discovery Kingdom? 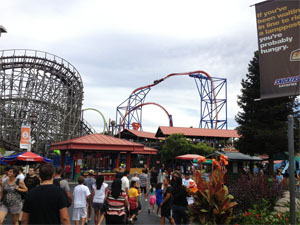 Located just outside of San Francisco, Discovery Kingdom (formerly Marine World) is home to 45 rides, including 8 roller coasters. The park recently moved to a year-round schedule, joining Magic Mountain as the only Six Flags parks with a full operating season. Six Flags Discovery Kingdom is a popular destination for locals and tourists alike, but when is it least crowded? Let’s take a look at what the crowds look like throughout the year. New Year’s Day – Holiday in the Park extends through the first week of January, but the bulk of the holiday season crowds are gone after New Year’s Eve. MLK Weekend – Crowds at Discovery Kingdom are expected to be manageable for the 3-day weekend. Presidents Day – Crowds are expected to be light throughout weekends in February, but may pick up a bit for Presidents Day Weekend. Spring Break – Discovery Kingdom is expected to be crowded for the Spring Break season starting on the week before Easter through the week of Easter, as schools in the area get out of session. Aim for going on weekends early in March to avoid the big crowds. Memorial Day Weekend – Fridays and Sundays in May are your best bets for lighter crowds, as the park starts to get busier for the summer season. Memorial Day Weekend, which marks the start of daily park openings, is traditionally very busy. Summer Season – The earlier in June you go, the lighter the crowds tend to be. By mid-June, most schools are out for the summer and it’s crowded even on weekdays. Avoid going on Saturdays if you can, as it’s the busiest day of the week. 4th of July Weekend – The summer crowds are out in full force in all of July, and Discovery Kingdom gets even more crowded for the 4th of July Weekend. Weekdays are your best bets for lighter crowds. Summer Season – The summer crowds start to die down in August. This time, the later in the month you go, the lighter the crowds will be as more schools get back in session. Crowds are usually manageable again by mid-August. Labor Day Weekend – The crowds are back on the Saturday and Sunday of Labor Day Weekend. Labor Day itself is typically the better day to go. Fright Fest – The annual Fright Fest takes over Discovery Kingdom in October. Like most Halloween events at other parks, the earlier in the month you go, the shorter the lines will be. Crowds peak around Halloween, so try to go early in the season. Veterans Day Weekend – Crowds are typically very manageable throughout November, but pick up a bit for the holiday weekend. Saturday, Sunday, and Veterans Day are usually busier. Thanksgiving Week – The bulk of the Thanksgiving crowds arrive after the holiday, on Black Friday and Saturday. The days before Thanksgiving are usually manageable. Holiday in the Park – The holiday season takes over Discovery Kingdom in December, with crowds peaking on Christmas week. The park is closed on Christmas Eve and Christmas Day. New Year’s Eve – Discovery Kingdom traditionally isn’t very crowded for New Year’s Eve. Crowds and lines are manageable. For crowd predictions of upcoming dates, as well as historical crowd ratings, check out the Six Flags Discovery Kingdom Crowd Calendar. When do you think is the best time to visit Six Flags Discovery Kingdom? How crowded was it when you went? Be sure to let us know in the comments below! Is it packed during the beginning of March? What are the wait times? It’s usually manageable then since that’s before the Spring Break season. I’m thinking 20-30min waits. Just wondering why Sunday September 18 might be more crowded than Saturday September 17? September 18 is a Bring a Friend Free Day. I’m thinking of going the weekend of April 22nd…will it still be full with Spring Break crowds or will it be thinned out by the end of the month? Saturday might still be fairly busy with some of the Spring Break season crowds, but I think Sunday will be manageable. What days are bring a friend free ? How crowded is Six Flags Discovery Kingdom the day after Thanksgiving(Black Friday)? Idk if I should go bc I don’t want to sit in long lines.